GKN Driveline supplies the new Citroen DS5's eAxle, an electric drive axle that incorporates proprietary disconnect clutch technology. The eAxle gives the DS5 on-demand all-wheel drive and contributes to the car's overall all-terrain functionality. GKN's electric drive axle is capable of delivering 1500 newton meters of torque to the rear wheels. GKN Driveline also supplies the DS5's rear sideshafts. 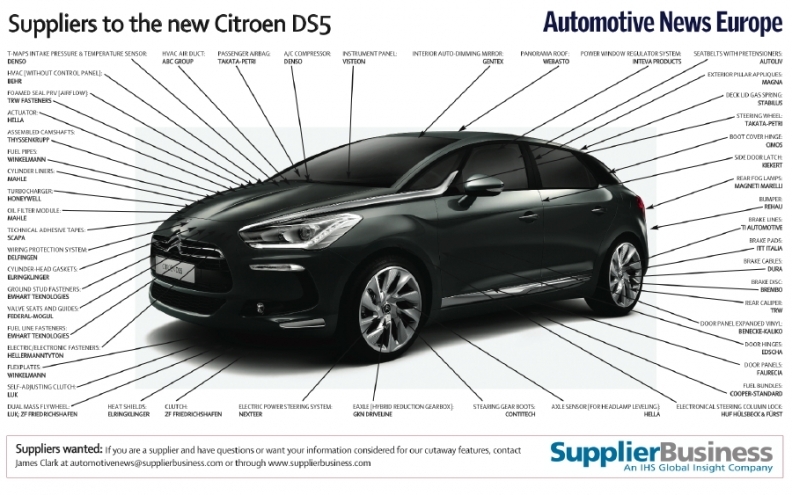 The DS5 is the first Citroen model to offer parent PSA/Peugeot-Citroen's diesel-electric hybrid technology, along with conventional diesel and gasoline engines. The DS5 diesel hybrid uses a 2.0-liter diesel engine to power the front wheels and a 27kW (36-hp) electric motor for the rear wheels, providing 200 hp but low CO2 emissions at 99 grams per kilometer. Sister brand Peugeot is offering the diesel-hybrid drivetrain in its 3008 and 508 models. The DS5's rear bumper comes from Rehau's plant in Feuchtwangen, southern Germany, while the bumper supports are from Rehau's factory in Poix, France. The components are delivered, completely fabricated – including stainless steel exhaust trim, rear fog lamps, number plate light, parking sensors, rearview camera and cable harness – directly to the Citroen's assembly line in Sochaux, France. Citroen unveiled the DS5, the third model in its upscale DS lineup, at the 2011 Shanghai auto show. The model is being manufactured on the PF2 Platform and according to IHS Automotive forecasts, production is expected to peak in 2012 at 35,103 dropping slightly to 32,129 in 2013.